By Mark Nessia. 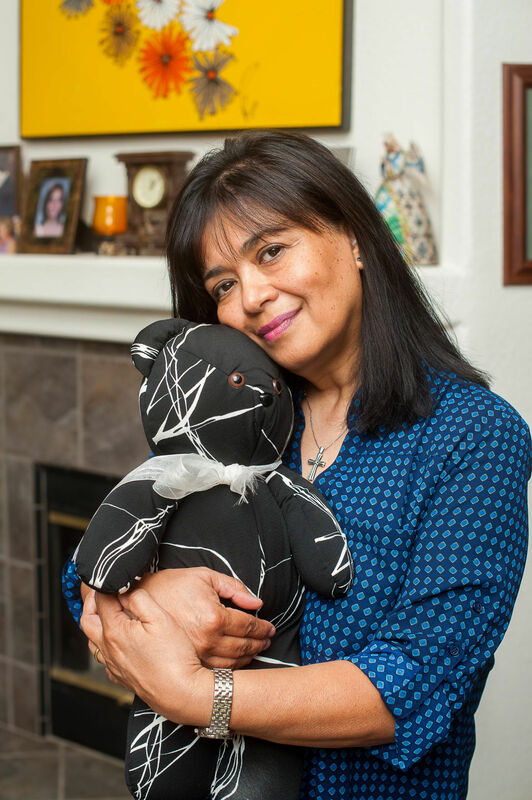 Corinne Ruiz holds a teddy bear that was made with her daughter Olivia’s dress that she wore for her eighth-grade graduation dance. Olivia was diagnosed with Long QT syndrome and died from sudden cardiac arrest at the age of 14. The hallway and living room no longer echo in laughter or guitar melodies inside the home of Corinne Ruiz. There are no longer mom-and-daughter moments shared in the evening when her daughter Olivia would jump on her mother’s bed, a sign it was time to chat about life, boys and friends. But as deep as the emptiness may feel inside the home where 14-year-old Olivia grew up, her mother’s eyes sparkle – in the midst of tears that fall down her face, when she talks about her little girl. As a toddler, Olivia was a character. She wasn’t afraid of anything. And she was a little dynamite. Ruiz remembers the countless moments in the car when she’d look at Olivia through the rearview mirror and they’d make eye contact. “She’d be staring at me and pulling out her bows, like saying, ‘Mom, I don’t like bows,’” Ruiz said. As she grew older and entered middle school, Olivia’s personality and self-confidence led her to try out for cheerleading, basketball and track, regardless of her petite size. She had a love for life and wanted to experience everything it had to offer. “When I look back now, it’s like there was a reason she wanted to do everything, because she wasn’t going to live long,” Ruiz said. The teenager had dreams of studying abroad and playing in an all-girl band, jamming melodies on a pink polka-dot guitar. But as active and healthy as Olivia looked on the outside, little did Ruiz know her daughter was a ticking time bomb. A few weeks before Easter Sunday 2004, as a freshman at Liberty High School, Olivia told her mom she was feeling lightheaded after gym class. Even sitting down, she felt like she was going to faint. Then came the heart palpitations, strong enough to make Olivia feel like her heart was going to explode out of her chest. The left arm and neck aches followed. So the mother-daughter duo left the doctor’s office that day feeling uneasy but hoping for the best. Easter Sunday was Olivia’s last day alive. It was a day full of love and laughter, memories that Ruiz holds close to her heart. The next morning, Ruiz found Olivia unconscious in her room. She dialed 911 and her son Manuel began CPR on his sister while they waited for an ambulance. Olivia went into cardiac arrest several times during the three days she was in the hospital. “Every time I heard Code Blue, I knew it was her room,” Ruiz said. A pediatric cardiologist informed Ruiz that her daughter suffered from Long QT syndrome – a heart rhythm condition that can potentially cause fast, chaotic heartbeats. There is a four-minute window to restart the heart and stop the quivering before a person is declared brain dead. Olivia was airlifted to the Los Angeles Children’s Hospital, hoping for a miracle. But after the seventh day, there was no more brain activity. “We let her go,” Ruiz said, wiping tears from her eyes. Olivia was an organ donor – a decision she had made at the young age of 12. Her heart valve was healthy and went to a 3-year-old boy, whose heart beats today. And her corneas went to a toddler and a 22-year-old man, who now have sight. That was the beginning of Olivia’s Heart Project. “After she passed, it took me a few years to find my way back but I decided her death was not going to be in vain,” Ruiz said. In 2010, she began advocating for automated external defibrillators to be placed at high school campuses. She wanted to raise awareness for sudden cardiac arrest. Even after attending board meeting after board meetings to share why AEDs and CPR training were vital in schools, nothing changed. “I wasn’t going to give up,” Ruiz said. It wasn’t until Caleb Hannink collapsed in November 2012 in the Centennial High School gymnasium and ultimately died that the KHSD board of trustees gave Ruiz a call. Today, there are 122 AEDs in the high school district. More than 190 staff members have been trained in CPR and AED use. And more than 5,000 students have been educated in basic life-support skills. Olivia’s Heart Project is working with surrounding school districts, like McFarland and Arvin, to have AEDs on their campuses. Besides sharing AED and CPR education, Ruiz has partnered with the Bakersfield Heart Hospital and the Los Angeles Children’s Hospital to provide free heart screenings twice a year for kids ages 12 to 18. There have been 15 kids who have been diagnosed with heart abnormalities since the first heart screening took place. Ruiz’s goal is to have a bill pass in the state of California that mandates AEDs and CPR training kits in all elementary, junior high and high school campuses in the state. And have equipment to travel to remote locations and provide free heart screenings for the youth.